Jump for Justin at Skydive Toronto in Cookstown last month (July 14) raised over $15,000 ($15,740.95) for Youth Haven, Simcoe County’s only residential emergency shelter for youth who are experiencing homelessness. More than 70 family and friends took part in tandem jumps in memory of Justin Keogh. Justin’s wish list for his 19th birthday was to skydive. Five years ago, three days before the celebration, Keogh and two teenaged friends were killed in a car crash near Alliston. From left are Wendy McBurnie, Mary-Ellen O’Neill-Madeley (director of fund development, Youth Haven), Janette Boyter. “Justin was an air cadet, so flying and skydiving was always at the top of the list. For each person who jumped for Justin, Skydive Toronto donated $50. An online auction was also held. 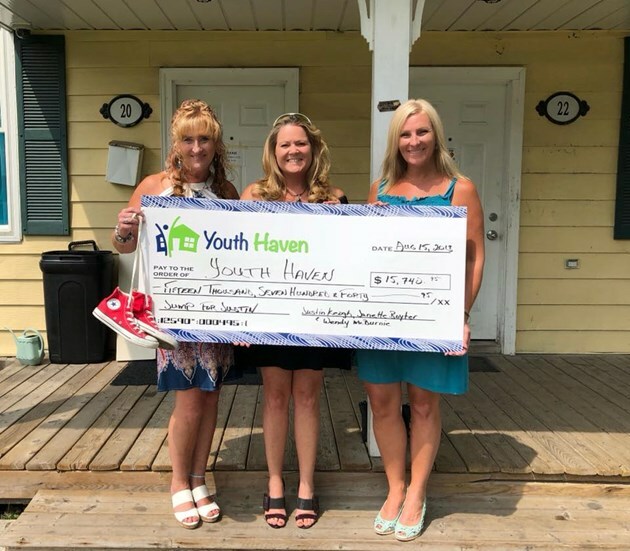 Youth Haven is a Barrie-based emergency residential shelter, with outreach programs in Alliston, Midland, Orillia, Innisfil and Bradford.